July 7, 2016 0 comments on "Growing and Harvesting Rose Hips"
Roses can do more than grace our landscapes and floral designs. Like its cousins the apple, pear, peach and cherry, roses produce a fruit. Rose Hips are a valuable source of vitamin C, containing as much as 20 times more vitamin C than oranges. They are also an excellent antioxidant. When growing roses for hips, you’ll want to select a variety that produces a reasonably large fruit that is high in vitamin C.
Look for disease and insect resistant roses that won’t require the use of chemical sprays. Rugosas are an excellent choice for quality hips, and they are also a beautiful addition to the landscape, whether used as a dense hedge or a specimen plant. The flowers have a delightful fragrance and you’ll be tempted to cut armloads to bring indoors, but try to resist the temptation. Remember, the more flowers you cut, the fewer hips you will have. Rose hips ripen after they are touched by the first fall frost. The color of rose hips varies, but in general, orange hips are not quite ripe, and deep red hips are overripe. Overripe hips are sweet, but have lost much of their vitamin C.
Rose hips will have the most nutritional value when used immediately after harvesting. To prepare rose hips for tea, cut off the bloom stem, cut the hip in half, and scrape out the seeds and hairy pith. This can be very tedious with tiny hips, so you may want to save the smallest hips for jellies. Rose hips used for jellies don’t need to be seeded or scraped. A half and half mixture of rose hip juice and apple juice makes a tasty jelly. 1. Use a glass or enamel pan for this recipe. 2. 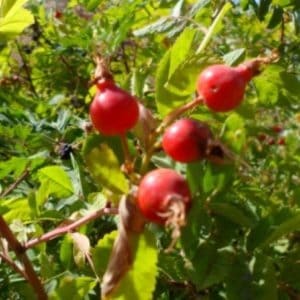 Clean rose hips as described above for tea, and soak in cold water for two hours. 3. Simmer in water for two hours. 4. Strain and reserve liquid for jellies or other recipes. 5. Measure the mash, and add 1 cup of brown sugar for each cup of mash. 6. Boil down to a thick consistency. Written by Jackie Carroll. Reprinted with permission.